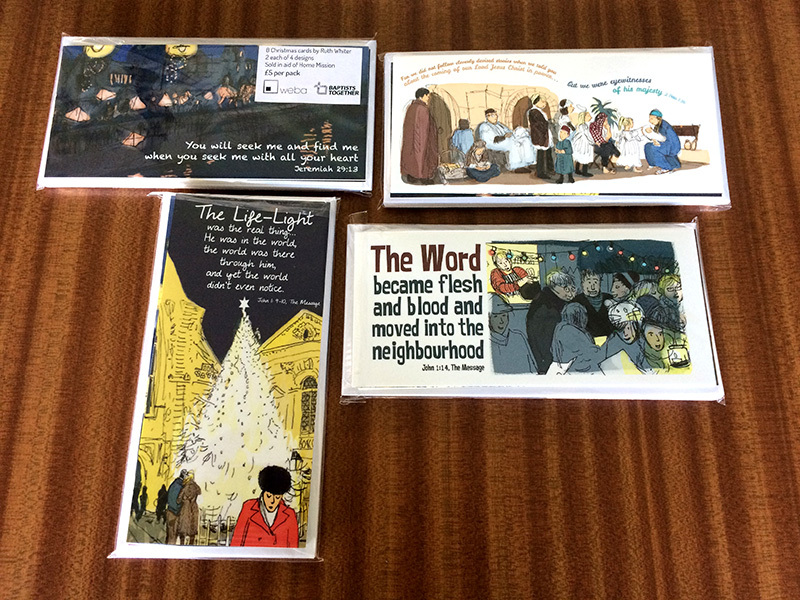 Those of you who like your Christmas cards a bit Biblical might like to know that you can now get these four Christmas cards in a pack of 8 (2 of each design) for just £5. The four designs are sketches I’ve done in Bath, Bristol, Calne, and Clevedon over the last four years for our work Christmas card at WEBA, and the verses are all about the incarnation, God coming to earth, but they’re not so much the ones that get over-used at Christmas. We’re selling them in aid of Home Mission, and you won’t get cheaper cards from me under any other circumstances anywhere. They’re on top quality 300gsm stock and come complete with envelopes. I have carefully inserted each set into a very compact cellophane sleeve myself. Contact me if you’re interested; postage is £1.50 extra.